The what we do leaflet - How? Why? DIY! 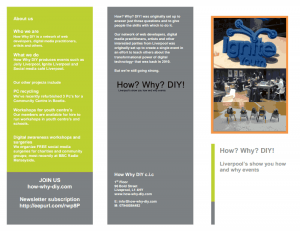 I had a few hours spare the other day and decided to put it to some constructive use and hey pesto before I knew it I had created a leaflet about How Why DIY? The what we do leaflet can be downloaded and printed out, so do feel free to do just that. I’ll be distributing them around the city as much as is possible along with recruitment posters for Ignite very soon.